​The spacious pool side of the Napa Rocks Hotel is the venue for the Pambos Pool Party which is on every Thursday afternoon of the summer. With revellers often in their thousands, this is the place to go. With an electric atmosphere and cool vibes, this is one wild party not to miss. The island's hottest DJ's bang out the tunes alongside some of the world's top DJ's with special guests performing through the summer. The Pambos pool party team cater for your every need, from vip booths and table service to cocktails and shots at the bar. 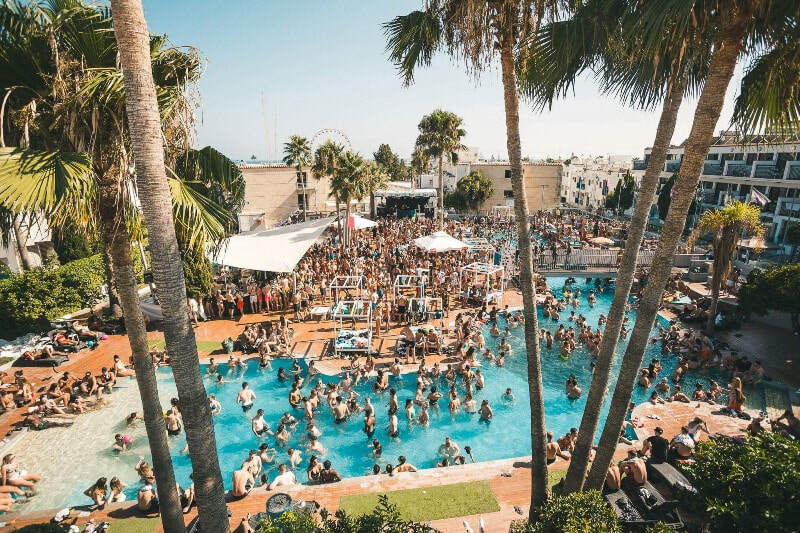 Pambos Pool Party is on Every Thursday from 16 May until the end of August 2019. Get Your Tickets Below. Standard entrance tickets and VIP packages available. Includes 1 hour free Bar! Book your tickets below. VIP 4 person Package - Includes Entrance for 4 people, 1 hour free bar, 4 person bed/booth, 2 litres Absolut vodka + mixers. Costs €200 for 4 people. (€100 deposit to book and pay the rest on the day) Vodka can be exchanged or upgraded for alternatives on the day. VIP 10 Person VIP Package - Includes Entrance for 10 people, 1 hour free bar, 10 person bed/booth, 5 bottles of Absolut vodka, 5 bottles of Prosecco, unlimited mixers, waitress service and queue jump to the event. Costs €500 for 10 people.